As usual, the Philadelphia Eagles are banged up heading into their matchup this Sunday against the New York Giants. Most notably, the Birds will be without their top four cornerbacks, so Jim Schwartz will have to figure out a way to defend Odell Beckham and the Giants' offense with practice squad-level players. The Giants, meanwhile, listed one non-factor on their final Friday injury report. That's it -- one guy. • CB Jalen Mills: Mills was toasted quite a bit during the early part of the season, but he was playing better when he went down with a foot injury. After seeing some of his replacements in action over the last few games, it is clear why Schwartz prefers Mills over the rest of the bunch. In the absence of Mills, Sidney Jones, Avonte Maddox, and Ronald Darby, who is on IR, the Eagles will have to roll with Rasul Douglas, Chandon Sullivan, DeVante Bausby, and Cre'Von LeBlanc at corner. • CB Sidney Jones: Jones probably came back too early, prompting the Saints to test him early and often, and they were able to exploit the fact that he was not 100 percent. In hindsight, the Eagles probably should have held Jones out until he was truly ready, though I can understand the urgency to get him on the field, given the extreme number of injuries in the secondary. • Avonte Maddox: Maddox's injury looked more serious when it occurred than it actually is, but he'll still likely miss some time. His rookie season has been encouraging both at safety and slot corner, and his absence is significant. 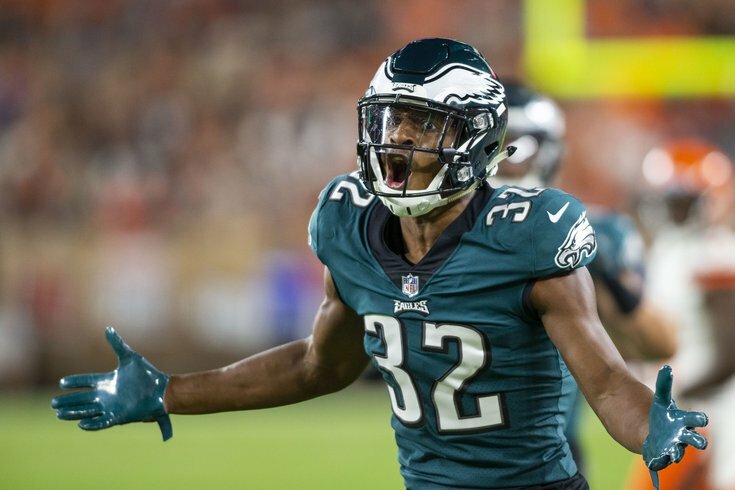 • LB Jordan Hicks: This is perhaps a weird take, but Hicks' absence might not be the worst thing for the Eagles, as they'll get a chance to see how Kamu Grugier-Hill would look in a starting role. Hicks is a free agent this offseason, and the Eagles will have to make a decision on how important he is to the team, and how much they're willing to spend to keep him. How Nigel Bradham and Grugier-Hill play with Hicks away could be part of that puzzle. • RB Darren Sproles: This will now be the tenth straight game that Sproles will miss after injuring his hamstring Week 1 against the Atlanta Falcons. He's been day-to-day for almost three months. • QB Nate Sudfeld: Third QB. • OG/OT Matt Pryor: Pryor is the lone Eagles player who has appeared on the inactive list for every game this season. • DE Kerry Wynn: Rotational defensive lineman. 28 tackles, 1.5 sacks. He was the only player listed on the Giants' final Friday injury report. • C Jon Halapio (IR): Halapio is done for the season with a broken leg. He was the starting center. John Greco -- and later Spencer Pulley -- took over for him. • RB Jonathan Stewart (IR): Stewart is on IR with a foot injury, though he may return to the active roster at some point later in the season. I don't know why the Giants would really want him to, however, seeing as he isn't a good player anymore. • CB Sam Beal (IR): The Giants used a 3rd round supplemental pick on Beal, who injured his shoulder soon after and went on IR, ending his season. The Giants will be without their 3rd round pick in the 2019 NFL Draft as a result. • WR Cody Latimer (IR): Latimer had 6 catches for 108 yards on the season. He had 3 catches for 52 yards against the Eagles Week 6. He went on IR with a hamstring injury.